For many homeowners, their garage door is purely a functional machine they deal with; they put up with rattling, squealing and shaking because “that’s just how garage doors are”. 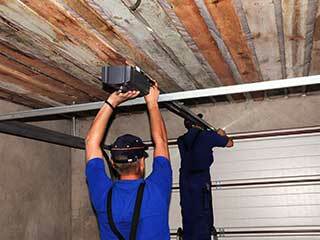 At our company, we know that an overhead door can really make a difference to the comfort of your home life. We think there’s a lot you can do to improve your garage door system, and we wanted to share a few tips with you. If you have an old chain or screw-drive unit that makes a loud, rattling noise each time you use it, then it may be time to treat yourself to a new belt drive opener. The simply change in drive system will introduce you to a new world where your door will open and close in near utter silence. The rubber-conveyer belt like drive has no grinding parts so it's able to work much more quietly and smoothly, and if your garage is attached to your home, this difference can be life changing. Real wooden garage doors look fantastic, but they’re heavy, expensive, and require a lot of maintenance. Instead, why not consider purchasing a new steel door with a wood finish? Brands like Clopay and Amarr have beautiful looking collections that are great examples of this; their faux-wood finishes are textured with real wood grain, and you can even clad your door in convincing replica mahogany. Smart home technology is the next big thing, and there are many ways to add a little 21st century connectivity to your garage. Many manufacturers, like Chamberlain and LiftMaster, for example, are investing in technology like the “MyQ” app, which can allow you to control your garage door remotely from almost anywhere in the world. This can be perfect if you leave in a hurry and forget to close the door, or need to let somebody, like your friends or your in-laws in while you’re away on holiday. Our team at Garage Door Repair Brushy Creek can consult you on the different models that are available for you to choose from, and make sure that you don't neglect to take other special features, like a backup battery system and rolling code technology, into consideration.